Write on the Sound (WOTS) writers’ conference is sold out, however, there are three events associated with the conference that are free admission and open to the public. The first is an evening of poetry with Washington State Poet Laureate Claudia Castro Luna and local poets Gerald Bigelow and John Wright, Friday, October 5th, 5:00 - 5:45pm, at the Edmonds Library, 650 Main St.
Claudia Castro Luna served as Seattle’s Civic Poet from 2015-2017 and is the author of the Pushcart nominated Killing Marías and This City and is the creator of the acclaimed Seattle Poetic Grid. Born in El Salvador, she came to the United States in 1981. She has an MA in Urban Planning, a teaching certificate and an MFA in poetry. Claudia is joined by local poets Gerald Bigelow, who leads the local EPIC Group Writers poetry group, and John Wright. Light refreshments provided. For more information call 425-771-1933, see the library webpage. The WOTS Book Signing Reception on Saturday October 6th, 5:15 – 6:30pm in the Plaza Room, 650 Main St (above the library), is also a free-admission public event. 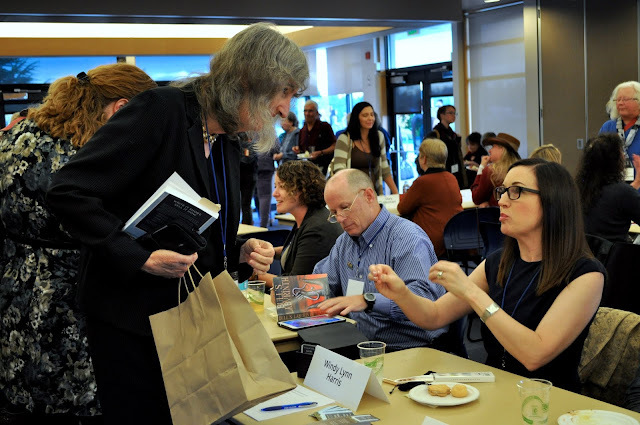 It’s a great opportunity to mingle and chat books and writing with conference speakers and attendees, as well as explore the on site Edmonds Bookshop. Enjoy light refreshments and the stunning view of the Puget Sound from the Plaza Room patio. The conference reception is presented by the City of Edmonds Arts Commission with generous support from Windermere Real Estate Edmonds. For a list of speakers and presenters and links to their websites, go to the conference webpage. After the Booking Signing Reception, head to downtown Edmonds to Café Louvre for Open Mic Night. Enjoy hearing WOTS conference attendees and presenters read five minutes each from their fiction, nonfiction and poetry. The event is open to the public, 6:30 - 7:30pm. Café Louvre is located at 210 5th Ave S.
For more information on all three programs, call the Edmonds Arts Commission office at 425-771-0228.